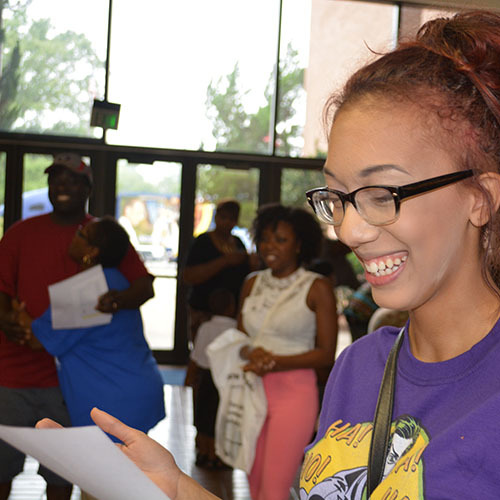 June 15, 2015 – Students that are new to Fort Valley State University’s campus will get another opportunity to finish their enrollment process at an event designed to help them make the transition to FVSU as smooth as possible. The campus, through the coordination and leadership of the Office of Student Success and Enrollment Management, will be hosting the fourth of six New Student Orientation sessions on Friday, June 19, from 9 a.m. until 2p.m. in the C. W. Pettigrew Center Auditorium. Additional sessions are slated for July 10 and July 24, 2015. FVSU staff will be on hand to help new students finalize their enrollment profile. Orientation check-in starts at 9 a.m., and the official program begins at 9:30 a.m. with a welcome from Dr. Angela Harris,vice president for Student Success and Enrollment Management, followed by presentations from admissions, financial aid, student financial services, residential life, advisement, campus safety, food service, and the bookstore to name a few. “We expect more than 100 new students, including freshmen and transfer, for the June 19 session,” Keese said. “The goal is to further introduce families to FVSU, issue new students a fall class schedule, complete the financial aid process, receive residence hall room assignments, receive a student I.D. card, tour the campus and visit the Dining Hall for lunch at a discounted price. These orientation sessions will enable them to finalize the process prior to the beginning of the Fall 2015 semester. New students report on August 13. Freshman Convocation is scheduled for August 14. For more details, contact the Office of Campus Life at (478) 825-6290 or keesew@fvsu.edu.